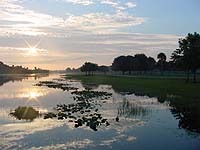 While Titusville is located on the western shore of the Indian River Lagoon, the country's most biologically diverse estuary, it sits atop the Atlantic Coastal Ridge, a natural boundry between the Indian River Lagoon drainage basin and the St. John's River drainage basin, adding to the astounding diversity of plant and animal life to be found here. Page two will deal with wildlife sites related to the St. John's River drainage basin, where aquatic birdlife such as limpkins not found in a salt marsh enviroment can be found, as well as terrestrial mammals, reptiles, and other life associated with more inland habitats can be found. is a constucted wetlands designed to be a biological filtering system that reduces nutrient levels of treated water before reaching the St. Johns River. The man-made wetlands cover 300 acres and can process over 6.75 million gallons of water a day. Completed in early 1998 and opened to the public for Bird Watching and Wildlife Viewing, the wetlands are just as wild as they would have been 100 years ago, and attract numerous species of birds and other wildlife. The wetlands park is located on the south side of State Road 50 just west of the I-95 interchange. A remote operated gate is often drawn across the entrance to the plant but a button is mounted on the left side of the access road. Pushing this button will alert a city employee who will open the gate for you. After signing in at the office, proceed to the back of the plant section to the entrance of the raised berm road which surrounds the wetlands. Follow the raised berm road to the right to begin the tour. Some of the more noteable species found here are sandhill cranes, which nest here, heron species such as great blue, little blue, green, and night herons, snowy and greater egrets, ducks, coots, rails, comorants, anhingas, and many other aquatic bird species as well as otters, alligators, and turtles. At least 2 white tail deer have also been spotted here. Use your browser's Back button to take you back to your exact position on the table. Photo of Sandhill Crane by Dean Richard Pettit. is a truely unique sanctuary where Walking & Learning trails wander through timeless Scrub, Mesic, and Hydric ecosystems with their wide variety of endangered and threatened species. The relationship between soil types and plant communities is easily seen here. Guided hikes are available or you can strike out on your own with a map provided by volunteers at the visitor's center and gift shop, who are always eager to answer any questions. A study conducted in 1994 documented usage of the Enchanted Forest Sanctuary by 52 bird species including wild turkey, bald eagle, red-shouldered hawk, barred owl, cooper's hawk, northern bobwhite, eastern screech owl, and numerous songbird species. Bobcats and white tailed deer also are known to be here. In addition, this sanctuary provides refuge for two of Florida's endangered reptiles, the eastern indigo snake and the gopher tortise. With the Titusville area being located within an isotherm, a transitional zone separating a temperate and a subtropical climatic zone, the variety of plant life to be found here is truely astounding. The Official Friends of the Enchanted Forest Website? Just kidding! These guys are great, check out the site! Brevard County Environmentally Endangered Lands Program! Photo by Dean Richard Pettit. at 2000 Wuesthoff Street is Just off Barna Ave, just south of Cheney Highway in Titusville, Wuesthoff Park is a 25 acre park that offers good hiking and birdwatching through a variety of habitats including a boardwalk over a small wetlands, and trails that loop through hardwood hammock and and upland pine habitats. This is a nice park for family gatherings. Beautiful deeply wooded hike, picnic area, and a nice mowed open field and play area. More info from North Brevard Parksand Recreation! at 4400 Fox Lake Road is a 37 acre recreational park with picnic facilities, vollyball courts, a large pavillion with a stage, a boat ramp and fishing dock on Fox lake. (My largest largemouth bass I ever caught came while fishing right off this dock, 7.5 lbs.) It is also the home of the Fox Lake Bluegrass Festival as well as several other festivals throughout the year. Other than the park, the shoreline around the lake is in it's natural state so many species of wading birds and other wildlife can be viewed from the park. As you enter the park, take the one-way road immediately to the right, which follows the shoreline. The earlier portion of this route goes along a narrow channel leading to the lake itself with marshlands just on the other side, making for relatively easy viewing of the marshlands and their associated wildlife. The road then turns to the right along the shore of the lake towards the boatramp. The lake itself is not that large, therefore scanning the lake shore for wildlife is relativly easy. Putting in a boat, kayak, or canoe provides access to not only the whole of Fox lake, but to South lake through a canal connection between the two. Wading birds such as egrets and herons can be seen here as well as american coots, gallinulles, osprey, and many other species. This is also one of the better places to go if you really want to see an american alligator. (no swimming allowed) Of course if your luck is anything like mine, there's never one around when your actually TRYING to see one. is found on the corner of Holder and Dairy roads in Titusville. About 6 acres in size, it is a preserved section of Atlantic Coastal Ridge pine scrub habitat with about a half mile trail looping around the outer parimeter and other trails through it. Located atop an ancient sand dune, this type of unique habitat is rapidly being bought up by developers in Florida and is probably the most endangered habitat in the state. It is dominated by tall slash pine trees and a lower growth of scrub oak and saw palmettos. Nice 1/2 to 1 hour hike and lots of songbirds during migratory periods. encompasses 9,291 acres and has two entrances and parking areas on the north side of State Road 46. The eastern entrance is .75 mile west of I-95 while the western entrance is 6.4 mile west of I-95. Boating and canoeing access can be from the boat ramp at Six Mile Creek, a County boat ramp 3.5 miles west of I-95 on the north side of S.R. 46. Hiking, biking, horseback riding and hunting in season are allowed here and there are four primative campsites available on a first come, first serve basis. This is a type 2 management area, meaning during hunting periods you must have a valid hunting license to enter the property and no camping is allowed. The ridge found in the eastern part of the property supports about 200 acres of scrubby flatwoods and oak hammock which is the habitat for the florida scrub jay, Florida's only endemnic bird species. A basin swamp community dominates the eastern third of the property. this basin receives runoff water from the surrounding uplands and drains into a wet prarie which forms the the headwaters of six mile creek. The western portion of this property features a large floodplain marsh and a large marsh lake, Buck Lake. Overall, this conservation area provides protection for many natural communities and provides habitat for not only scrub jays, but gopher tortoises, bald eagles, otters, deer, fox, bobcats, turkeys, herons, egrets, owls, and woodpeckers. encompasses 4,392 acres of St. Johns River floodplain and hiking, biking and horseback riding are offered here. The Florida Trail Association maintains about 10 miles of trails which can be accessed from two points. One is through an agreement with the Great Outdoors R.V. Resort, about 1/2 mile west of Interstate 95 west of Titusville on the south side of the road. You must pass through the resort's gate. Inform the guard there that you'd like to use the Florida Trails Association Trailhead and he will give you a pass that hangs from your mirror and direct you to the trailhead. At the trailhead facing west you will find two trails. The one to your right follows the Addison-Ellis Canal on a dike, then crosses it and extends through the marshes for about to SR 50, where there is another access point. This route offers expansive views of the marshes, which provide habitat for a diverse population of wildlife, including numerous migratory and resident wading birds and waterfowl, alligators, and many endangered species. This trail is referred to as the White Trail, and is roughly 4 miles in length one way. To the left at the Great Outdoors Trailhead, a couple of loop trails, the Red and Blue Trails, take you through wooded hammock habitat providing habitat for various songbird species, deer, turkey, and other wildlife, while looping around an extensive indian midden. The other access point is about 2 1/2 miles west of I-95 on the left and is the termination for the White Trail. (look for small sign on south side of road; just past the sign to the St. Johns NWR on the right - no public access to refuge now). There is no camping or hunting allowed here. can be found west of Titusville on SR 50 over the St John's River and into the town of Christmas. Look for Look for Taylor Creek Road on the south side of SR 50. Then head south for about 3 miles and you'll see the entrance on the left on Beehead Road. There is a two dollar per vehicle day use fee. You can utilize Power Line Road, Long Bluff Road and Fish Hole Road to effectively form a loop around the preserve. According to the Florida Trail association there is a southern hiking loop trail that can be accessed from SR 520 2 miles east of the St. John's River although this map does not extend this far south. This 28,000 acre area runs along the St John's River and features about 30 miles of trails, primative camping, virgin pine flatwoods, and a 900-acre virgin cypress swamp which running along Jim Creek is thought to be the largest remaining stand of cypress left uncut in the state. This is a beautiful area which can be accessed from the last parking area west on Power Line Road before it crosses Jim Creek. The trail head is a log bridge over a creek just accross the road from the parking area. In the pinewoods near Beehead Ranch at the end of Beehead Road, some of the tall slash pines are thought to be 250 years old. Although the woods were ravaged by wildfire a few years ago, many survivors remain. The understory has recovered providing perfect conditions for berry bushes. Springtime is prime time for berry picking, with abundant blueberries and blackberries coming into season around mid-May. Bird and wildlife watchers will love the opportunity to see some of the large raptors such as osprey, bald eagles, and swallow-tailed kites that can be found here. 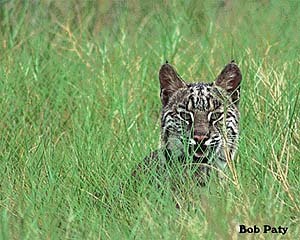 Wild turkey, white tailed deer, bobcat, racoon, armadillo and on rare occasions, Florida panther can also be spotted here. Other points of interest include the 30 indian mounds in close proximity to the trails. The St Johns River and the vast savanah like flood plain can be viewed from two locations west of Titusville. The East Orange County Boat ramp and parking area on the St. John's River is 5 miles west of I-95 on SR-50. This is a good place to scope the wetlands for a variety of waders, ducks, and many other species associated with the St. John's River. C.S. Lee park is a three acre park on the St. John's River 8 miles west of I-95 on SR-46. Another good place to scope the river and wetlands.